Traveling has been, and will always be one of my greatest teachers. I recently returned home to Seattle from a life changing trip to Costa Rica. Prior to this trip, I had not left the country for almost 8 years. The last time I left the country, I had been traveling around Mexico and Belize with my dear friend and soulmate. During our travels we kept saying to each other that things were too good to be true because everything and everyone we had encountered thus far was fantastic. But we were right, it was too good to be true, because my friend ended up drowning in the ocean in Puerto Escondido. I miss her everyday. I’ve spent the past several years healing and grieving her passing, living life each day knowing that there are no guarantees, and our existence is precious. Don’t take things or people for granted. I caught my first travel bug my junior year of College. I took a quarter off from my studies and worked to save money to go backpack around Europe with a good friend from my childhood. We saw incredible places and art and architecture, we met all kinds of interesting and wild people. I fell in love with Scotland and vowed to go back someday, which I did a year later and stayed for 8 months. When I returned to Washington State, which has always been my true home, I got a job as a Barista at a coffee house. Thats where I met Brittany, and we decided to go travel around Mexico and Central America. We planned to go to Costa Rica, but never made it. Returning home from the nightmare of Brittany drowning, I had no idea what to do or where to go next with my life. All I could do was live moment to moment. Everything in Seattle reminded me of my friend. I felt lost, I felt uninspired and complacent. So one day I decided to move to California. I had some friends there. It was sunny, it was something different. I packed up my VW Jetta and drove south. I saw friends in Portland for a few days, I couch surfed with a pot farmer in Chico, and a software designer in the central coast. I visited an old friend in San Diego who was in the Navy there. Then I went back north to the vicious beast of a city Los Angeles, where I stayed for two years. I had a good friend there. And a guy I liked. I bought a little sailboat and sailed and partied all of the time to try to subdue the confusing emotional state I was perpetually in. Being on or in the water has always contented me, and somedays it was scary and painful to be in the ocean where Brittany was swallowed up, but a bigger part of me felt even more connected to her. I think thats why I bought a boat. She would have said to do it too. One day I found myself going to yoga at a popular donation based studio in Santa Monica. I had done some yoga before, but nothing that had a profound affect on me. My teacher in Santa Monica was the first teacher that gave me that profound awareness, the yoga high. I drank the koolaid, and I couldn’t get enough. Being in that practice space, on my mat, with Travis’ voice guiding me was where the real healing began for me. I realized my time in Los Angeles needed to come to an end, and that my path was to become a yogi. I sold my boat, said goodbye to my friends, and drove home to Seattle. I called my old boss at the coffee house and asked if I could come back and work, and he said he had been waiting for me. I worked hard and began researching yoga schools to study at. I went to Maui and studied with two incredible teachers. Getting deeper in my yoga practice, allowing myself to address my pain and confusion through spirituality and being in nature on a beautiful Island in the middle of the largest ocean in the world. I had found my calling. I came back to Seattle and began teaching yoga. After 5 years of teaching, I planned to teach my first solo lead yoga retreat in Costa Rica. A place I had been compelled to go to for the past 8 years. I finally made it there, doing what I love, and sharing my wisdom with others. I went through an array of thoughts and feelings. It was both relaxing and challenging to be there. I was putting out a lot of energy into guiding the retreat group, but also having moments of self reflection. I felt raw and vulnerable. I was able to peel away some layers of myself that I hadn’t been fully ready to address before. Costa Rica is a beautiful country, with kind people and an easy going way of life. People there seem to understand what is most important in life. Its said to be one of the happiest countries in the world, and its one of the most sustainable ones too. The energy of the land and the people is wise. The last night I was in Costa Rica my group and I went to the beach to watch the sunset. We ran into the ocean and body surfed. My friend who came along on the trip with me and I looked at each other and shared a moment that we both knew would never ever happen again. We smiled and laughed and decided right then and there. To let go. Home in Seattle again. Single for the first time in 5 years. I have my true loves though; yoga and traveling. Today is a new day, and I’m ready for whats next. Letting go is something we talk about often in yoga. But its so much easier said than done. Recently, one of my friends and fellow yoga teachers mentioned that it bothers her when yoga teachers say “just let go.” Something I am admittedly guilty of suggesting time and again. It led me to ask myself the question, What does it really mean to let go? Furthermore, how do we go about doing it so it doesn’t just sound like some hippie dippy cliche term that only people with perceivably legitimate first world problems can say? Just let it go. Drop your fears, your stresses, your doubts, your limitations, your trauma, your anger, your pain. Easier said than done, I know. We all have our own set of issues we dwell on. Work stress, money problems, relationship and family challenges. Child hood trauma, which we may or may not be aware of on a fully waking conscious mind kind of level. Emotional and mental stress, cellular memory, all of these factors contribute to tension that builds in our mental and physical body. When we come to the yoga mat, we are given a sanctuary in which we can begin to release, and let go, so to speak, of all of the tension society and life inevitably creates. The fact is, many people tend to suppress these stress inducing realities that we all face at some point or another. Some people simply are at a loss as of how to deal with these realities. Society has conditioned us to disconnect with our underlying truths. By having at least the intention to let go, we can begin to address what exactly it is we are holding onto that makes us feel weighed down and lacking the tools to relieve ourselves of it. When we allow ourselves to be aware of the tension creating entities, we can begin to learn how to let go through movement and meditation. We hold onto ideas and feelings created by our mental and emotional states of being, based on incidents and experiences throughout our lives. Some of the experiences seemingly tattoo our hearts and memory, henceforth affect us on much deeper, long lasting levels than we could imagine. If its trauma, sometimes that can create great stress and in turn even affect our health and our physical body. So when we say “let go”, we have a lot of work ahead of us. It starts with being willing to even go there, to those sometimes dark and tangled places within us. To start the journey of unraveling the mess so we can see some light come through, and begin to understand what it means to let go. That letting go is maybe more of a state of mind, a philosophy, a practice in itself, a tool to help you wake up and free you from what is keeping you from feeling more consistently at ease. In company with the many joys life graces you with, life will inevitably continue to through a profusion of challenges your way. If we can learn how to manage the philosophy of what it means to let go, we create space for ourselves to not only process our experiences, but to create space for the new ones, with an open mind and a healthy heart. When we can get a grip on letting go of the major things that weigh us down, the little things start to matter less, and life suddenly becomes a lot better. Start with right now. Embrace the theory of what doesn’t kill you makes you stronger. Don’t be afraid to be in vulnerable places within yourself. As lovely and relaxing as yoga can be, this practice isn’t a bed of roses. Practice and all is coming. 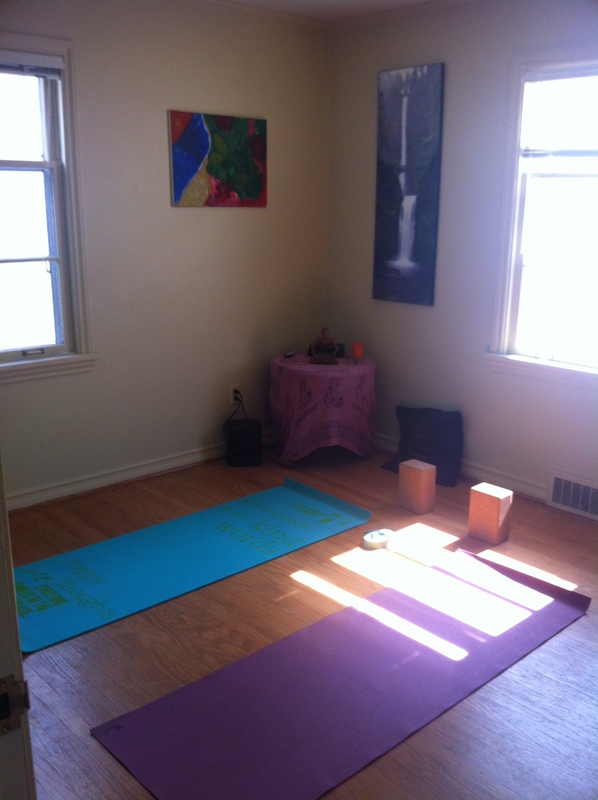 Join me at your convenience in my 91 square foot practice space for personalized yoga Sessions. For those of you who need some more one on one time in your practice, or don’t prefer a heated environment to begin on your yoga path, or you can’t afford a regular yoga practice. Whether you are wanting to build strength and flexibility, or are seeking meditation and therapeutics in your practice, I would love to help you incorporate more yoga into your daily life. Contact me with any concerns or questions. My prices are extremely reasonable and will vary depending on what you are looking for and how often you wish to practice. The Holidays. A time to celebrate tradition, honor your beliefs, change, joy, gratitude, and grace. . . maybe break out your showy decorations, make or buy presents, But we all know what this time of year also has a tendency to bring with it; The stressfullness of getting everything done in time. The obligation to see family, even though it may be inconvenient. Feeling obligated to gift give, Navigating your way through a season of consumerism and noise. Pleasing others is a beautiful thing, but is it really that gratifying if all that effort leaves you feeling emotionally and mentally drained, and with a dry pocket book, wishing you were laying somewhere on a tropical beach with a cocktail in your hand? Sadly, it seems with many holidays this day and age, the are far to many expectations to exceed. When did this become Christmas? Chanukah, or any of the other sacredly important Holidays celebrated this time of year? The hectic shopping crowds, the spending hundreds of dollars to travel somewhere you probably don’t really want to travel, when you could just be in the warm, comfort of your own home. I love my family, and have had many wonderful holidays with them, but I’m lucky that no one in my family makes me feel guilty if I don’t want to go out of my way to be there. They understand that Holidays can be overrated to a point of disappointment for a lot of people, so ultimately its about taking some time for yourself and doing what you need to do to get through the storm. Making an effort to be joyous, celebratory, and present with the ones you love daily opposed to reserving that kind of gratitude for one or two days out of the year. Its a very American thing to save all your celebration and hard earned downtime and try to cram it into a few days. That can’t really be healthy. We should be taking more downtime on the regular, to take care of our own needs, and to also honor the needs of others. If we reserve only a short amount of time to relax, but also knowing that that short amount of time comes with agendas and expectations, then its not about sharing joy and quality time with your loved ones, its about putting in your dues, and thats not something anyone really looks forward to. Remember to take time for yourself. Time to do exactly what you want and need to do, regardless of what kind of expectations anyone else has for you. Take time to be still, to be in solitude and silence, to take grounding, calming breaths. To laugh, and to cry if you need to cry. The Holidays put a lot of pressure on people to be happy and full of cheer, but for some, the Holidays bring up painful memories and past emotions. Be mindful of what others may be dealing with on a personal level and give them some of their own time to breath. If everyone takes that time to care for themselves, they can put more energy and care into giving those around them the love and support they want and hopefully have a legitimately pleasant Holiday season. free of expectations, free of stress, but full of cheer and light and gratitude. Ask yourself what the Holidays you celebrate truly mean to you and whom you share them with. No expectations, no judgement. Just honor whats important in your world. And remember not to sweat the small stuff.